Whether you’ve been with us for some time or are new to Pac Hort, we invite you to join us as we move into our next 50 years. 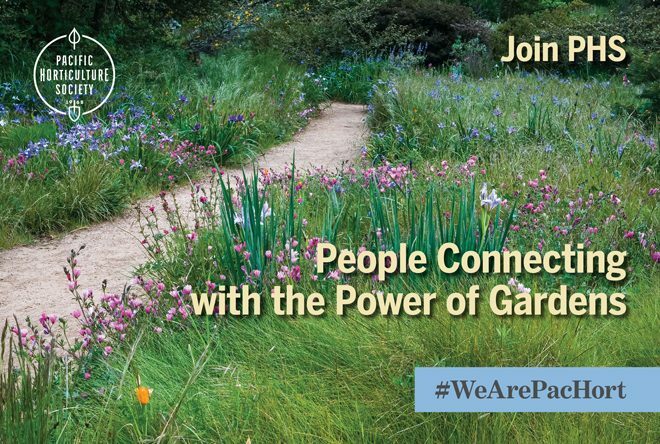 We believe in the value of environmental literacy and the power of gardens to enrich lives and heal our environments. We know you feel the same way. This is an exciting time. We’re bringing cutting-edge horticulture and emerging environmental science to our community through new programs, our much-loved publications, and expanded relationships with place-based organizations from B.C. to Baja. Become a member, renew, or extend your membership today. Or give us a call at 510-849-1627.